Pump Distribution across the UK. (a) Population densities and distribution in rural and urban areas. (b) The remoteness of the location and hence the stage at which centrally-supplied mains water was introduced. (c) The subsequent removal of pumps for health/tidiness/material recycling/land re-use reasons. (d) Patchy recording of those which remain. (e) And, surely primarily, the variable geology and topography across the country, which would have determined both the need for and the practicality of the sinking of wells or boreholes to reach the water table. 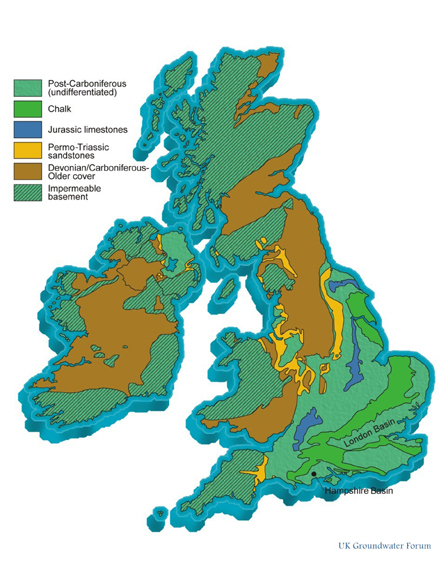 On the left, below, are some extracted examples taken from the National Register (as of Dec 2014) and on the right is a map produced by the UK Groundwater Forum which reflects the hydrogeology of the British Isles. Once the National Register is considered comprehensive enough, a comparison will be made with the locations of surviving pumps, in order to search for the expected correlation with the permeable layers and river gravels. In the meantime, take a look for yourself and let me know your thoughts please.